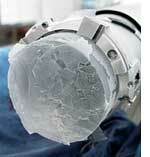 Greenland ice core analysis showed drastic climate change near the end of last ice age. Scientists have found two huge temperature spikes in the Northern Hemisphere prior to the close of the last ice age, about 11,500 years ago. They ascribe it to fundamental reorganization of atmospheric circulation. The ice core showed that the Northern Hemisphere briefly emerged from the last ice age some 14,700 years ago with a -5.5C spike in just 50 years, then plunged back into icy conditions before abruptly warming again about 11,700 years ago. The findings, published in the June 19 issue of Science Express, are expected to help scientists improve existing computer models for predicting future climate change. Plasmodium vivax can cause severe malaria associated with substantial morbidity and mortality, show two recent studies published in PLoS Medicine. The results challenge the belief that P vivax tends to be mild and P falciparum can be severe and life threatening. The studies found that P vivax cases peaked at an earlier age than those of P falciparum in young children, who were also more likely to develop the disease. The studies also reported cases of cerebral malaria due to P vivax, which the authors say is intriguing because it is rare. With calls for increased efforts to control malaria internationally, it will be important to ensure that P. vivax receives appropriate attention. Fast computers that consume less energy could become reality if the nano-scale strain in processors is controlled. Earlier, it was difficult to observe such strain. Local strain-induced deformation in the crystal lattice in processors improves their performance and manufacturers could not analyze deformations accurately. They relied on simulations and monitoring. Researchers in France have found a way out to map the deformations through a process called the electron holograph technique. The new measurement device overcomes nearly all the limitations of current methods and should enable manufacturers to improve microprocessor production methods and to optimize future computers, the authors said in the study published in the June 19 issue of Nature. No-take marine reserves, where fishing is banned, can lead to rapid comeback of fish species, says a new study of Australia's Great Barrier Reef published in the June 24 issue of Current Biology. The researchers found that the numbers of coral trout increased from 31 per cent to 68 per cent in no-take reserves compared to fished sites in two years or less. The authors said that the results represented a positive and unprecedented response to reserve protection. "Although preliminary, our results provide an encouraging message that bold political steps to protect biodiversity can produce rapid, positive results for exploited species at ecosystem scales. It is an important lesson for the entire world," said one of the researchers. It is believed that measles virus infects the host through the cells that line the airways before being passed to immune cells that carry the virus particles to other parts of the body. A study shows that the virus can infect by affecting the lymphocytes directly. The understanding will help identify the protein to which the virus binds. Despite the availability of effective vaccines, measles is still responsible for about 4 per cent of deaths among children under five years of age worldwide. Invasive species are tougher and less affected by changes in the environment compared to native species. Thus climate change will make it that much easier for invasives to push out native species. But this may not hold good in some cases, says a recent study published in the June 2008 issue of Conservation biology. Researchers of University of Wyoming say climate change may force a redefinition of invasive species. The study looks to understand the complex interactions between climate change and invasive species and their effect on aquatic ecosystems. Species that are native to a region may expand their distribution or increase their abun-dance and harm other native species. For example, warmwater stream fishes may expand their ranges northward or to higher elevations, where warming temperatures would allow them to displace native populations. Exposure to ozone, O3, during the first and second month of pregnancy may increase the risk of cleft plate, says a recent study. "O3 is a known strong oxidizing agent that can generate hydrogen peroxide, hydoroxyl radicals and superoxides, and could contribute to oxidative stress and causally influence the development of oral clefts," the study notes. Researchers found a 20 per cent increase in the risk of cleft plate per 10 parts per billion increase in O3 during the second month of exposure. The authors focused on traffic-related pollutants such as NOx, CO and O3 and air pollutants from other fossil fuel. Given that similar levels are encountered globally by large numbers of pregnant women, O3 may be an important determinant of orofacial birth defects, the paper said.